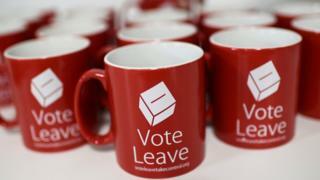 Vote Leave has dropped its appeal against a £61,000 fine for breaking electoral law over spending limits, the Electoral Commission has said. The official pro-Brexit campaign for the UK's EU referendum was fined in July for exceeding its £7m spending limit for the vote. The campaign said at the time the watchdog's findings were "wholly inaccurate" and politically motivated. It said in a statement it had run out of money to pursue the appeal. The announcement came as MPs rejected Prime Minister Theresa May's withdrawal agreement on the day the UK had been due to leave the EU. The Vote Leave campaign, fronted by Boris Johnson and Michael Gove, was found by the Electoral Commission to have funnelled £675,315 through pro-Brexit youth group BeLeave, days before the referendum in 2016, which helped ensure it did not breach its £7m spending limit. The founder of BeLeave, Darren Grimes, was fined £20,000 and referred to the police, along with Vote Leave official David Halsall. Vote Leave bosses say they were given the go-ahead to give the money to BeLeave and they had acted within the rules. But the Commission found there was "significant evidence of joint working" between Mr Grimes and Vote Leave and that Vote Leave should have declared the spending as its own. An Electoral Commission spokesman said: "Vote Leave has today withdrawn its appeal and related proceedings against the Electoral Commission's finding of multiple offences under electoral law, committed during the 2016 EU referendum campaign. Vote Leave has been contacted for a response. In a statement released to the Daily Mirror, the campaign said: "For almost three years, Vote Leave has successfully fought back against numerous allegations and conspiracy theories, spending almost £1m in the process.